Charles Eames and Ray Eames were married American designers who worked in and made major contributions to modern architecture, furniture, industrial and graphic design, fine art and film. 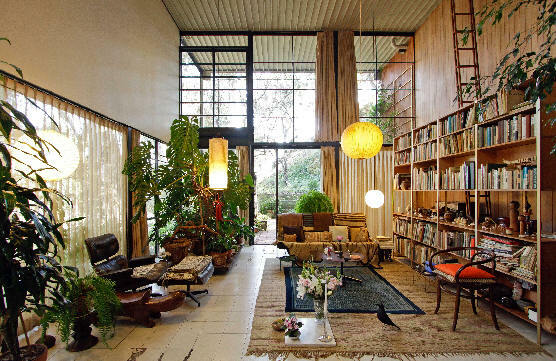 Charles Eames studied architecture for two years at Washington University in St. Louis on an architecture scholarship. 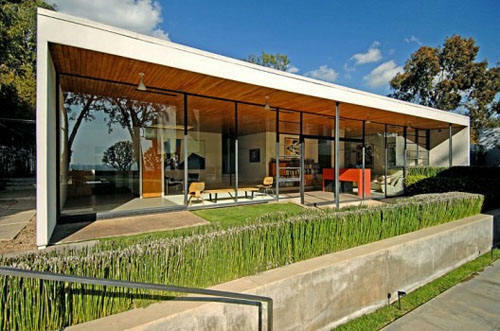 Many sources claim that he was dismissed for his advocacy of Frank Lloyd Wright and his interest in modern architects. While at Washington University, he met his first wife, Catherine Woermann, whom he married in 1929. A year later, they had a daughter, Lucia Atwood. Her son is Eames Demetrios. 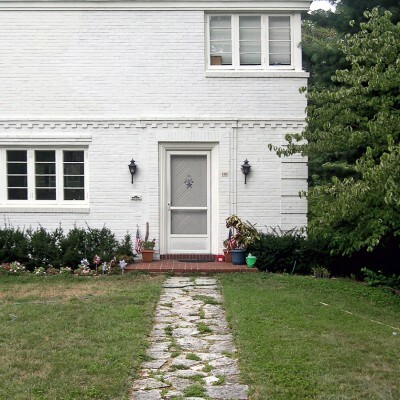 In 1930, Charles began his own architectural practice in St. Louis with partner Charles Gray. They were later joined by a third partner, Walter Pauley. Eames did several projects with Robert T. Walsh in another partnership Eames + Walsh. Charles Eames was greatly influenced by the Finnish architect Eliel Saarinen (whose son Eero Saarinen, also an architect, would become a partner and friend). 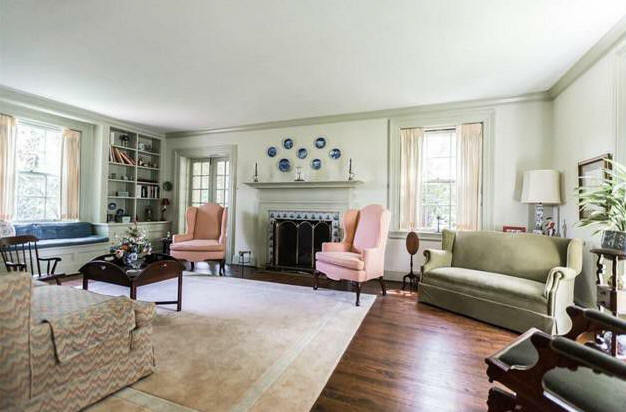 At the elder Saarinen's invitation, Charles moved in 1938 to study at the Cranbrook Academy of Art, where he would become a teacher and head of the industrial design department. In 1941, Charles and Catherine divorced, and he married his Cranbrook colleague Ray Kaiser. He then moved with her to Los Angeles. 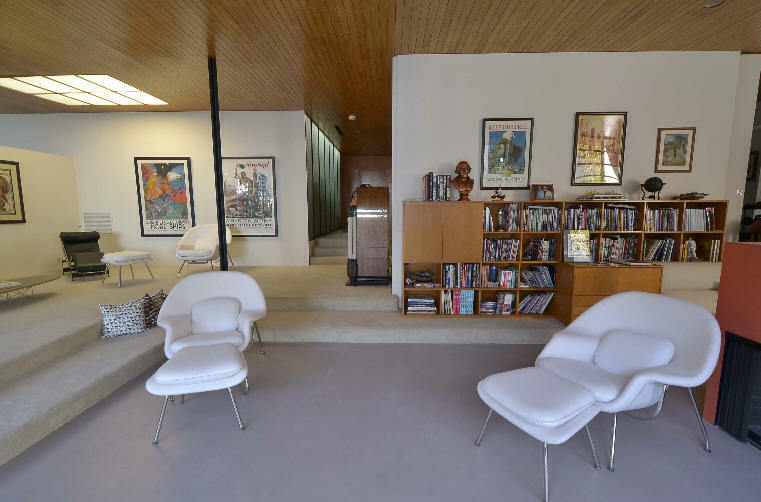 In the late 1940s, as part of the Arts & Architecture magazine's Case Study Program, Charles and Ray designed and built the groundbreaking Eames House, Case Study House #8, as their own home. Charles Eames died of a heart attack on August 21, 1978 in St. Louis, and was buried in the Calvary Cemetery there. He has a star on the St. Louis Walk of Fame. 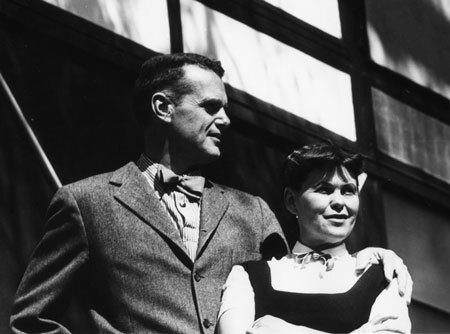 Ray Eames was born in Sacramento CA to Alexander and Edna Burr Kaiser, and had a brother named Maurice. She spent her early childhood years with her parents in their apartment, and then moved to a Bungalow outside of the town. Her parents taught her the quality of enjoyment which later led to inventions in furniture design and toys. In 1933 she graduated from Bennett College in Millbrook NY and moved to New York City, where she studied abstract expressionist painting with Hans Hofmann. She was a founder of the American Abstract Artists group in 1936 and displayed paintings in their first show a year later in 1937 at Riverside Museum in Manhattan. 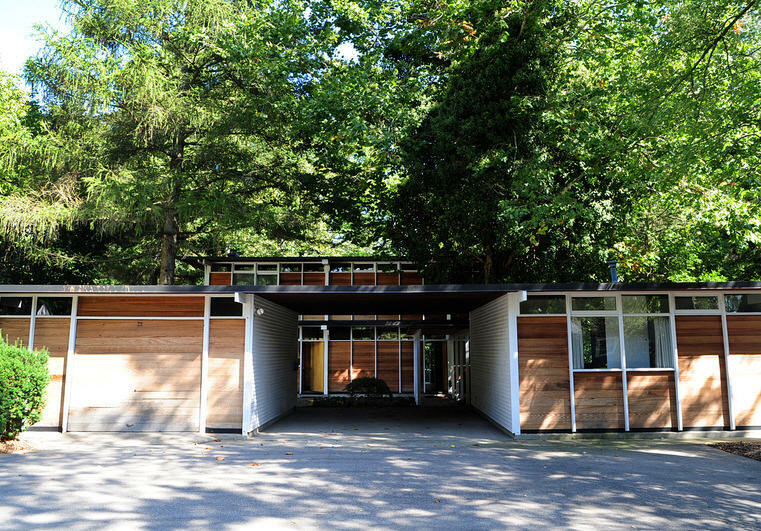 In September 1940, Ben Baldwin, an architect and friend, recommended she began studies at the Cranbrook Academy of Art in Bloomfield Hills, Michigan. She learned a variety of arts, not limiting herself to abstract painting. 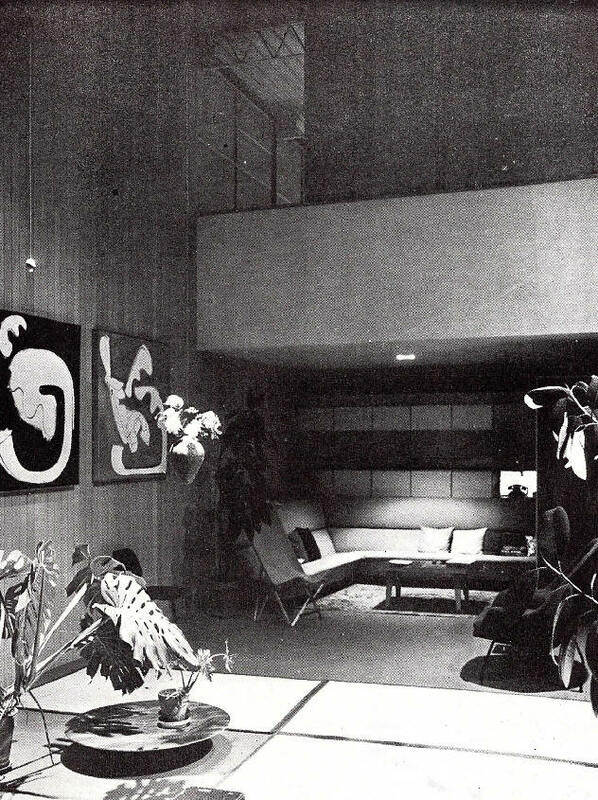 She worked with Harry Bertoia, Eero Saarinen, and others on the display panels for the exhibition "Organic Design in Home Furnishings" at Museum of Modern Art. The design process between Ray and Charles was strongly collaborative. After marriage the couple moved to California to continue their molded plywood furniture design and, in a later period, plastic. The graphic and commercial artwork can be clearly attributed to Ray, she designed twenty-six cover designs for the journal Arts & Architecture during 1942 to 1948, and a major part of the Eames furniture advertisements at Herman Miller (since 1948). 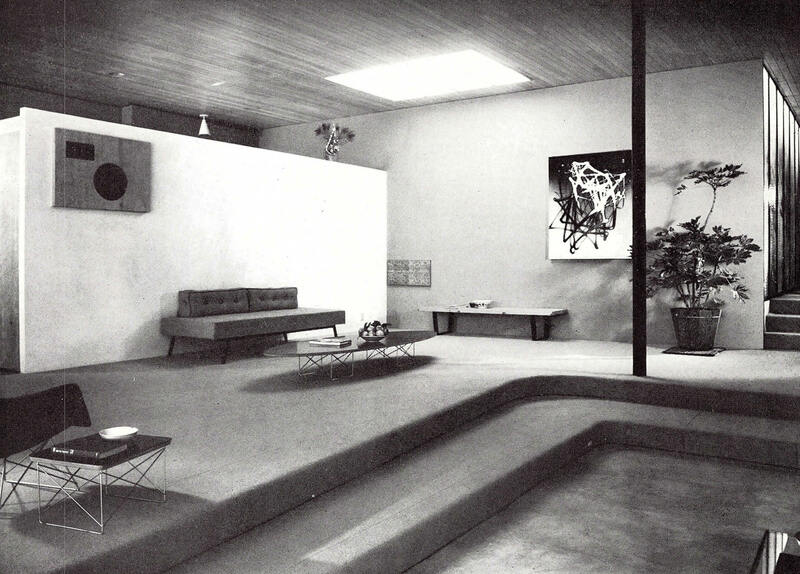 In the 1950s, the Eameses continued their work in architecture and modern furniture design. As with their earlier molded plywood work, the Eameses pioneered technologies, such as fiberglass furniture, plastic resin chairs, and the wire mesh chairs designed for Herman Miller. 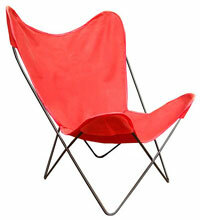 From the beginning, the Eames furniture has usually been listed as by Charles Eames. 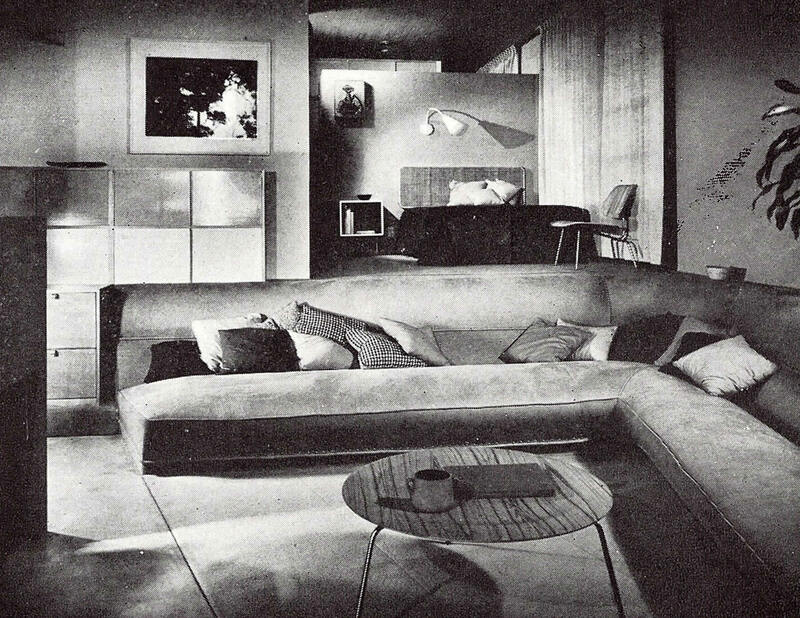 In the 1948 and 1952 Herman Miller bound catalogs, only Charles' name is listed, but it has become clear that Ray was deeply involved and was an equal partner with her husband in many projects. In 1979, the Royal Institute of British Architects awarded Charles and Ray the Royal Gold Medal. At the time of Charles' death they were working on what became their last production, the Eames Sofa, which went into production in 1984. They are best known for the Eames Lounge Chair and Ottoman, circa 1956. Charles and Ray produced several short films. From their first film, the unfinished Traveling Boy (1950), to Powers of Ten (re-released in 1977), their cinematic work were vehicles for experimentation and education. 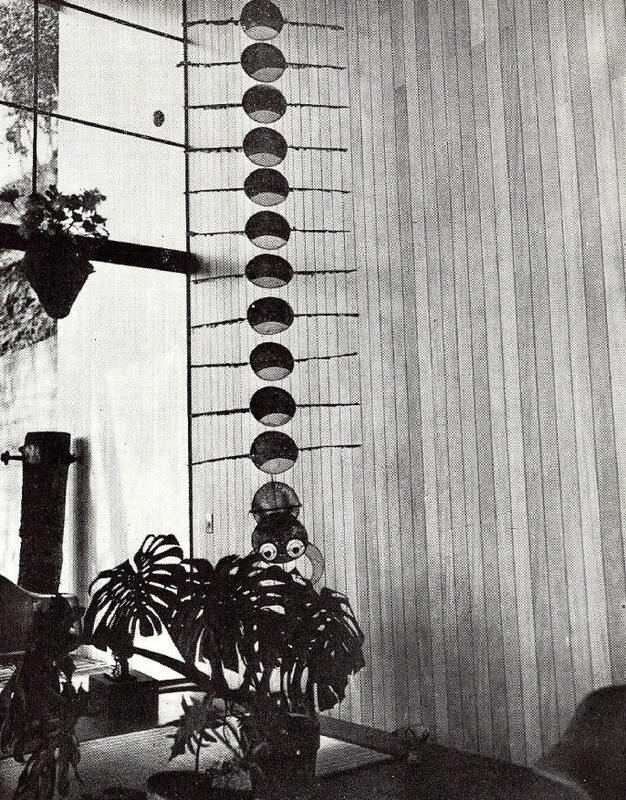 The Eames also conceived and designed a number of exhibitions. Mathematica: A World of Numbers... and Beyond (1961), was sponsored by IBM, and is the only one of their exhibitions still extant. The Mathematica exhibition is still considered a model for science popularization exhibitions. It was followed by A Computer Perspective: Background to the Computer Age (1971) and The World of Franklin and Jefferson (1975–1977), among others. 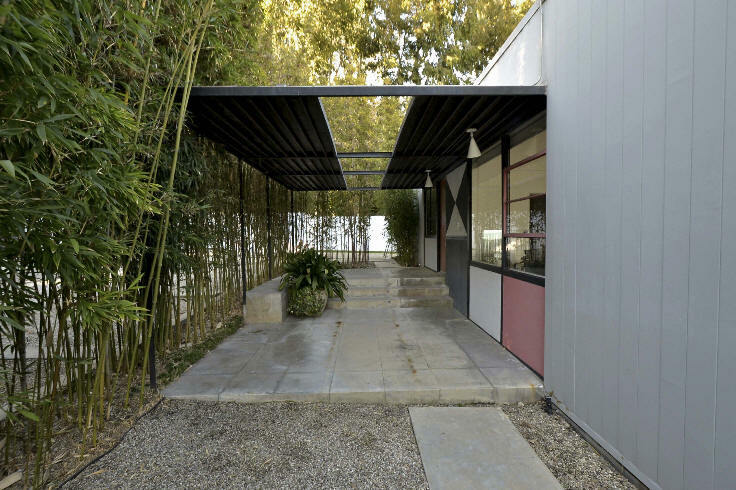 The design office of Charles and Ray Eames functioned for more than four decades at 901 Washington Boulevard in Venice, Los Angeles CA. After Charles' death in 1978 the Eames Office was disbanded. She worked on several unfinished projects – e.g. a German version of the "Mathematica" exhibition, was as consultand to IBM, published books and was administer of the Eames archive and estate. Ray Eames died in Los Angeles in 1988, ten years to the day after Charles. She is buried next to Charles in Calvary Cemetery in St. Louis. 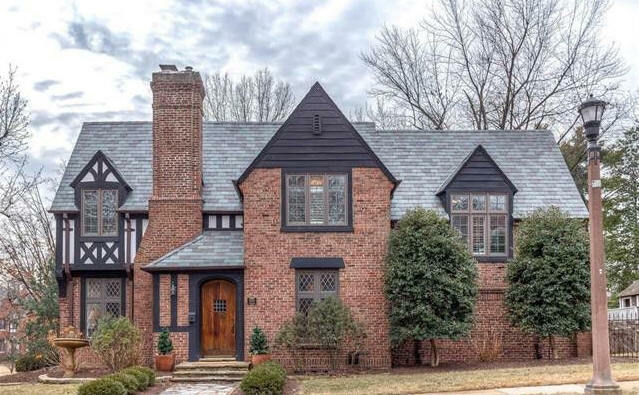 1932 - 7470 Kingsbury Boulevard, University City Missouri. Sold several times since 1988. 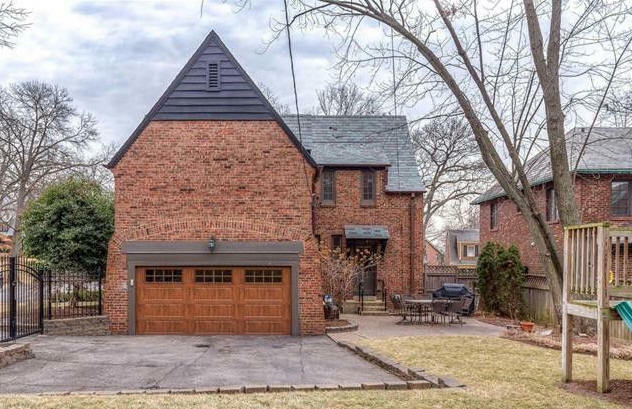 Sold in 2018 to Cory and Sydney Bailey. 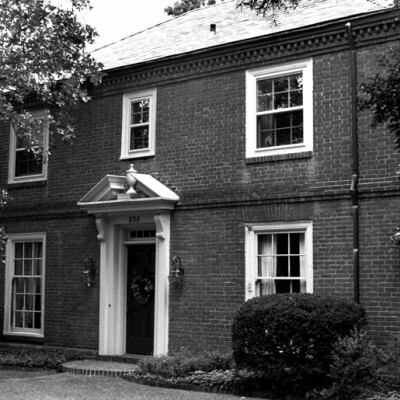 1936 - The Carlton M. Dean House, 101 Mason Avenue, Webster Groves MO. Designed with Robert T. Walsh. Built by A. B. Spradling. 1938 - The John P. and Alice Meyer House, 4 Deacon Drive, Huntleigh MO. Designed with Robert T. Walsh. 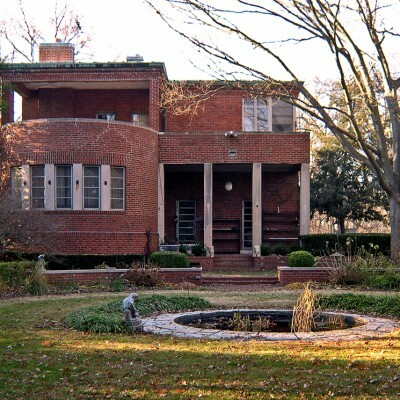 1939 - The Daniel S. and Jean Dinsmoor House, 335 Bristol Avenue, Webster Groves, MO. Designed with Robert T. Walsh. 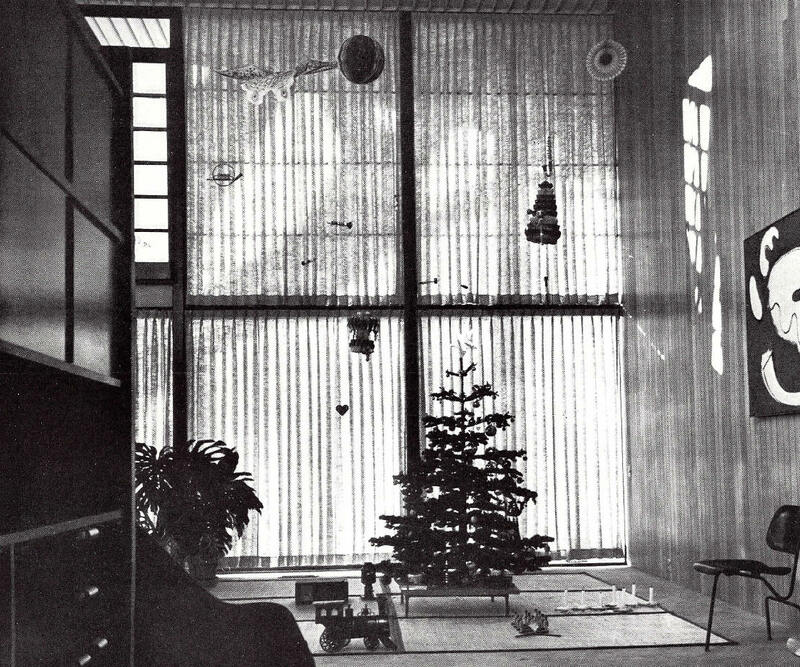 1949 - The Charles and Ray Eames House, aka Case Study House 8, 203 Chautauqua Boulevard, Pacific Palisades CA. 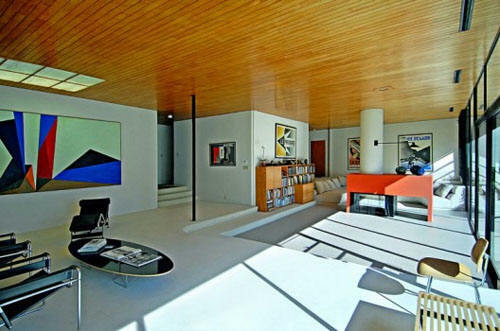 The first plan for the Eames’ home, known as the Bridge House, was designed in 1945 by Charles Eames and Eero Saarinen. The design used pre-fabricated materials ordered from catalogues (a continuation of the idea of mass-production). The parts were ordered and the Bridge House design was published in December 1945. Due to a war-driven shortage, the steel did not arrive until late 1948. By then, according to Ray, she and Charles had “fallen in love with the meadow,” and felt that the site required a different solution. Using the same off-the-shelf parts, but notably ordering one extra steel beam, Charles and Ray re-designed the house and built it. They moved into the House on Christmas Eve, 1949, and lived there for the rest of their lives. 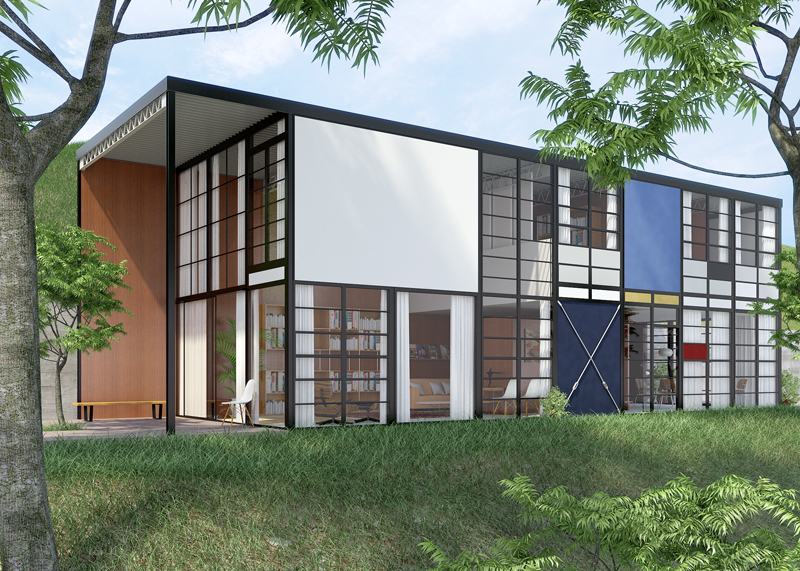 In 2004, Charles’s daughter, Lucia Eames, created a not-for-profit organization called the Eames Foundation to preserve and protect the Eames House and to provide educational experiences that celebrate the creative legacy of Charles and Ray. The house (exterior only) can be visited by appointment. 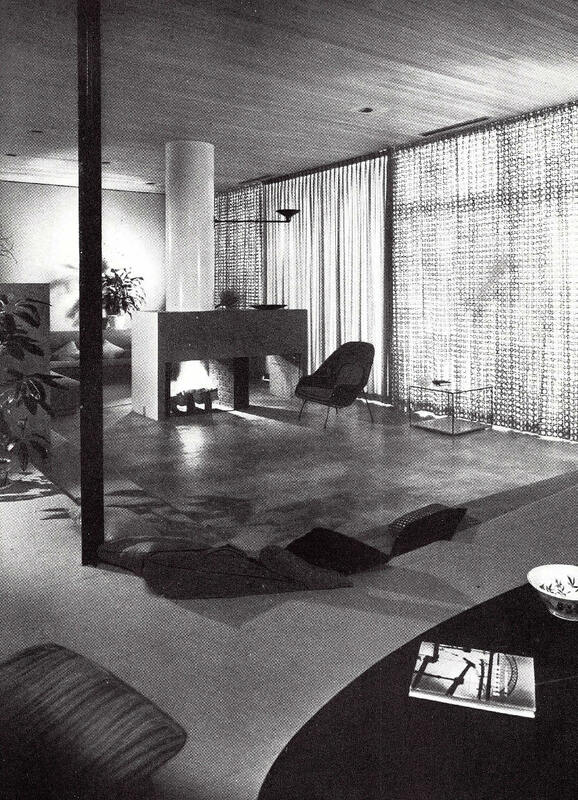 1949 - The John Entenza House, aka Case Study House 9, 205 Chautauqua Boulevard, Pacific Palisades CA. 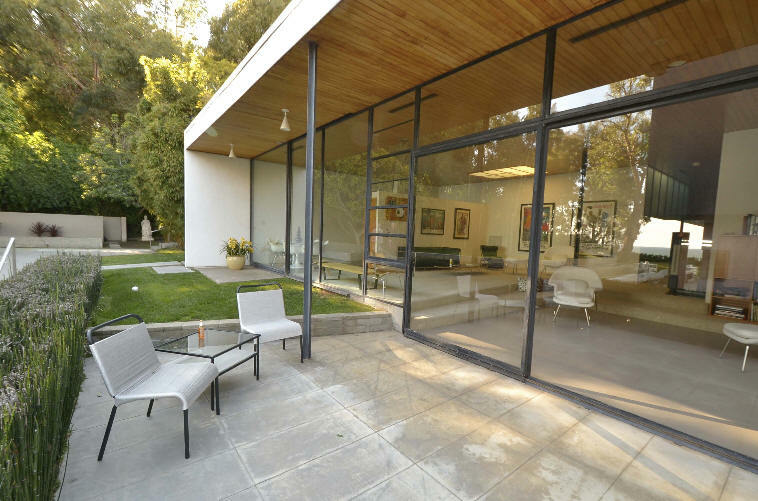 Designed by Charles Eames and Eero Saarinen. Has been remodeled. Sold to Jacob and Sandra Terner. 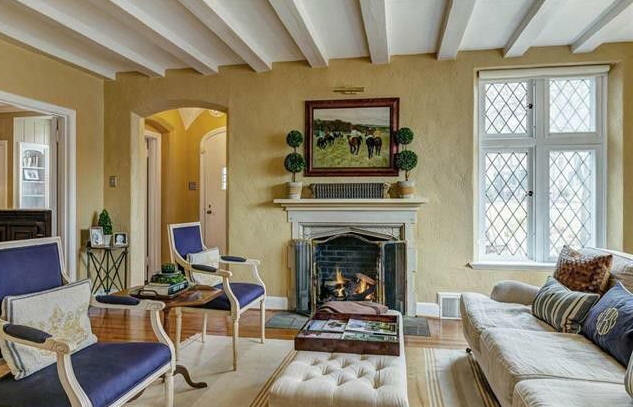 Sold in 2008 to the Terner Family Trust. Sold in 2010 to the Stiffleman Family Trust. Sold in 2012 to Winfield Holdings LLC. 1949 - The Billy Wilder House, Sunset Boulevard, Beverly Hills CA. Unbuilt. The space afeatured high ceilings and glass walls that flooded the interior with natural light. 1954 - The Max and Esther DePree House, 271 South Division Avenue, Zeeland MI. DePree's father founded Herman Miller. Additional Resources: Eames Demetrios, Eames Foundation.